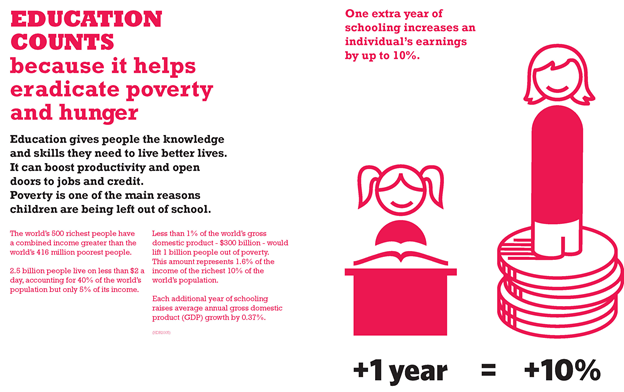 International Day for the Eradication of Poverty is celebrated every year on October 17. Officially recognized by United Nation in 1993, the first event actually took place in Paris, France in 1987 when 100000 people gathered on the Human Rights and Liberties Plaza. It is already 2011, the International Day for the Eradication of Poverty is now in its 18th year. Although people of the world have tried to fulfill Millennium Development Goals and United Nation is now in its Second Decade for The Eradication of Poverty, it is not yet finished, especially poverty, that author highlighted. In 18 year, a number that is not small, the theme for this year commemoration is “Only a Development that Includes Everyone is Sustainable”. After doing researches for few days, it is a pity that author’s group doesn’t find any evidence of events happened in author’s country, Indonesia, except for public dialogue with Parliamentarians on a Peasant Protection and Empowerment draft Bill. This dialogue resulted in a commitment to ratify draft bill prepared by civil society. Although it not that big of an event, I hope with the ratification, peasant’s right can be better fulfilled. Other than that event, although many had written article on this yearly event, and a few articles were written on newspaper about this day, but other than sentences like “We should reduce poverty in Indonesia” and “Government should care more for citizen issue” there was no more. Author doesn’t know whether that there were events but overshadowed by the cabinet reshuffle news and the royal Keraton Wedding news that happened in the same period. It is a pity though, because actually celebration of this events happened from few years before like in 2010, Demonstration from Union of The Poor, 2009 gathering in Taman Menteng Jakarta with artists and television, 2008 ‘Kampanye Bangkit dan Berbuat ‘(Stand Up and Take Action) in Sukabumi, and 2007 Stamp Designing Competition. In ASEAN itself, as author region, and as regional organization that made of some developing countries, the poverty issue is still being a problem. There are few country’s representative in author’s group, each country has their own way to make people aware of poverty issue. In Cambodia, The Prime Minister declared closing down all the Labor firms which recruited sent Cambodian women to work in Malaysia (16 October). This issue (people forced to work aboard because of poverty) is I addressed more, because Indonesia also has problem like this. Big population and small chance for getting job that can keep the pot at home boiling, many Indonesian women go working abroad without right procedure and getting mistreated, some tortured, and trapped in court case. The closing down of the Labor firms is a big move, because if the government do that, it must open more job opportunities inside the country. That, so far, is not yet happened in Indonesia. Author hopes that Indonesian government can, at least, protect its ‘foreign exchange heroes’ in their work abroad. For Vietnam, they ha ceremony of peak month for the poor (17 October-18 November ) awarding individuals with achievement in poverty reduction. In Philippines, they had celebration at the Commemorative Stone, replica of the original one, in Rizal Park, Manila. In Singapore there was One Singapore with fund raising concert. In Asia as region with more than half percentage of people in the world and one with many issues of poverty, as 2011 study on “The Global Social Crisis” by the United Nations result told us, many events also held for remembering the day. Japan is one of the country that give a big concern for this issue, seeing from the events held in the country. IVG Stand Up and Take Action Picnic was held in Yoyogi Park on Saturday (15 October) and had an open invitation in Facebook. Now people should give their thanks to technology. Organizing events, knowing and spreading news, with only one social networking account people can change the world, and there is proof of that. In fact, if you do, investigate in the major social networking like Facebook, Youtube, or Twitter, you can easily find people spreading news about this day. At whole, the event held is “Stand Up and Take Action”, three days (15-17 October) of mobilization of events and related action for supporting MDGs and have their voices heard. This action has its own website in standagainstpoverty.org, supported by UNIC, and encourage people to make their own event, providing downloadable event materials and other inspiration for event, past events, and others. There were so many events as the part of Stand Up mobilization, some that are quite unique like ‘Sing out Against Poverty’ that sings literary in England, Newmarket in Canada, ‘Peterborough’s first-ever poverty report card, football match in Iran, Congo’s bicycle with banderoles, and Inside-Out Shirt Day Global Event that has 583 people ‘attending’ worldwide. Unrelated to the day, there are also many campaign to eradicate poverty like ‘Take One Action Against Poverty’ with its photo contest and One Day’s Wager that invite people to donate their one day’s wager. In the end, like the saying, every effort counts, whatever it is. How simple, how little, if everybody does that, it will be something big. Awareness, concern, and telling others are also efforts. Like UN Secretary General, Ban Ki Moon said in his video message, “Together, let us listen to people – and stand up for their hopes and aspirations. That is how we will build a world free of poverty”. Posted on October 17, 2011, in Learning and tagged 17 october, Future of Asia, international day, povertym united nation. Bookmark the permalink. Leave a comment.